We can only build more houses, and transform more lives, if we have the land on which to build! Please contact Jack Wilson at 903-595-6630 x212 or ceo@smithcountyhabitat.org if you have property you would like to donate. Habitat homes are built through the generosity of our donors and volunteers. The building materials are purchased with financial support from corporate, community and faith-based sponsors. As a sponsor, your team or corporation gets priority in volunteer scheduling. 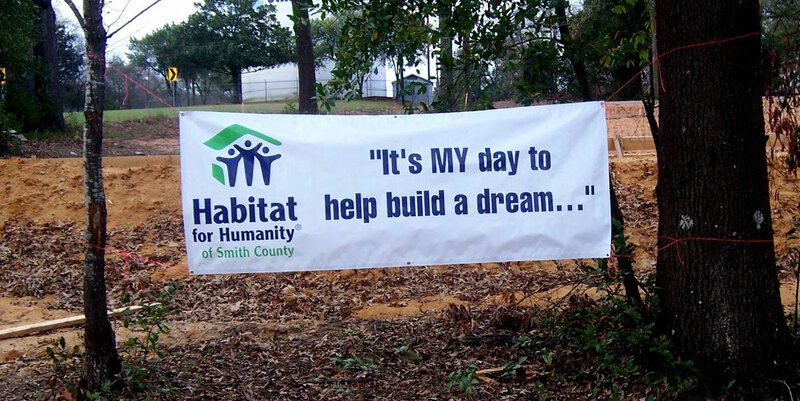 Have you included Habitat for Humanity of Smith County in your will? You can help make a difference in the lives of Smith County families now and in the future by remembering us in your will or other type of planned gift. Contact the Development office by calling (903) 595-6630 or send an email to rebecca@smithcountyhabitat.org. For more information on how your corporation, church or community organization can become a part of Habitat for Humanity of Smith County please contact us at: (903) 595-6630 or email: rebecca@smithcountyhabitat.org We would love to present the HFHSC story to you and your organization. HFHSC is committed to assisting families in need with the life-changing opportunity of buying decent, affordable housing using a team of enthusiastic volunteers and staff guided by Christian principles. We are a 501(c)(3) non-profit, publicly supported organization. Contributions are tax deductible to the extent allowed by law. In order to fulfill its mission, HFHSC maintains databases that are compiled exclusively of information knowingly and voluntarily provided to HFHSC by our donors and Web site visitors. HFHSC respects the privacy of all donors and Web site visitors. HFHSC does not disclose, give, sell, or transfer any personal information about our donors and Web site visitors unless required for law enforcement or otherwise required by law.